A beautiful story thanks for sharing it. I too am fortunate to have a partner who is my rock. He is the love of my life and my best friend. Hope you and your lovely Karen are having a good Easter Sunday. You are lucky and we really enjoyed the article and the videos. I am glad you paid props to the Cleveland Browns O-line. Since you came from the rear of the O-line, they technically did a great job breaking you free. Hope you had a great Easter! What a wonderful love story. Thank you for sharing. Karen is indeed a beautiful woman, inside and out. I have an incredible partner too. It is a wonderful gift. I always remember what a treasure he is, I certainly tell him often. BTW, nice to see more than Karen's blue coat. lol. You sound like two people who fit together so perfectly. 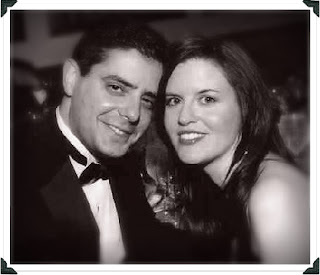 Thanks for sharing your beautiful love story, and may you continue to be richly blessed. That was a lovely tribute to your beautiful wife. You sound like a great team. re: "(note to self: great idea for screenplay-"Godzombie")" I prefer "Zombzilla." This was a beautiful tribute to your beautiful wife, Karen, who I have the privelege to know and am amazed by her strength and demeanor. To find a friend and companion who you can rely on and trust, is a great gift. But to find these these qualities in the person that you love, escapes description, words alone can not express the feelings within your heart and soul. If it is possible, I hope that your relationship with Karen, only grows stronger with time. It was wonderful to see more of Karen than her blue coat. She is beautiful. I like Zombzilla best too. Don't go to movies but definately would rent DVD. Looked at your pictures, like your look at NY. Thanks for all of the kind comments, folks. Karen really is terrific, and I'm a very lucky guy. Wow, that was so touching. You and Karen are blessed to have each other. OK - now I'm gonna cry - how beautiful. Hey Kamikaze! i got here because i am looking for mobility options. im a para and can walk with braces and a walker. im 47 and my disability is result of accident 4 yrs. ago. i am trying to figure out how i'll have the stamina to work which i must do to support myself and my 8 yr old daughter. goal is to teach. am on track except for the stamina issue. im looking for solutions. back to wheelchair is certain because walking in the braces is so exhausting and can't carry much with a walker. now must decide how to manage. these are complex issues as you know. thanks for being an inspiration. we are HUGE! it's just the damned packaging that's failing. glad to be having my moment of life in the 21st cent. so at least i can get around! best wishes. K.
H0w cool to read about someone who with his partner can make things work. When I was married to my high school sweetheart and hd 3 children, I was diagnoed with MS that after two relapses that has become progressive. I have now been married 37 years to this same great guy who still calls me sweetie. He is at my side through all my medical treatments and all our fun rock n roll concerts. I would not chose this, but sometimes being in a wheelchair has great advantages. And as they say, laughter is the best medicine. I think, in a past life (see previous comment on other post), I must have abandoned my spouse when s/he got sick. (That is, if I believe in past lives.) Now I'm the MS patient, with the husband I can't even believe I'm lucky enough to have. I, sadly, know if the shoe was reversed I would not be the good person he is. Hope that doesn't mean I have to redo this life again.